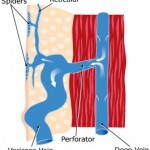 Varicose veins are gnarled, enlarged veins. Any vein may become varicose, but the veins most commonly affected are those in your legs and feet. That’s because standing and walking upright increases the pressure in the veins of your lower body. 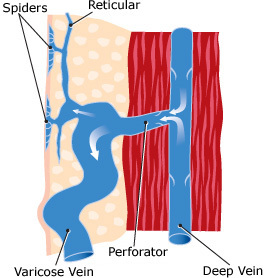 For many people, varicose veins a nd spider veins — a common, mild variation of varicose veins — are simply a cosmetic concern. For other people, varicose veins can cause aching pain and discomfort. 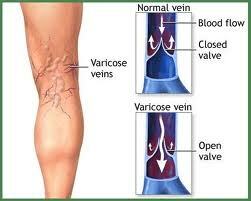 Sometimes varicose veins lead to more-serious problems. Varicose veins may also signal a higher risk of other circulatory problems. Treatment may involve self-care measures or procedures by your doctor to close or remove veins. 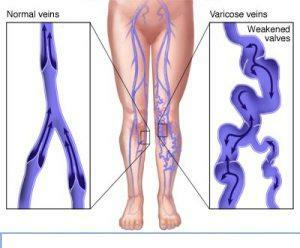 Varicose veins are a type of venous disorder that causes abnormalities in the veins, especially on the legs and feet. Though the cause may vary from person to person, the condition leads to swelling or enlarged veins that may be painful or itchy and can eventually lead to bleeding and (non healing) ulcers. Radiofrequency Ablation (RFA) the latest and most effective, patient friendly and non-surgical treatment for Varicose veins using Multipolar RFA machine. Under color-doppler Ultrasound vision, a radiofrequency catheter is inserted into the abnormal vein and the vessel treated with radio-energy, resulting is closure of the involved vein. The Interventional Radiologist accesses the abnormal saphenous vein percutaneoulsy through a small cannula in abnormal vein. Ablation uses a thin, flexible tube called a catheter with tiny electrodes at the tip of the catheter, which collapses the thick varicose veins. It is less risky as compared to surgery. Done as a Day Care procedure with no overnight hospital stay necessary. No blood loss or risk of blood transfusion. The recovery is very fast as compared to traditional surgery. The recurrence rate is very low as compared to conventional surgery. Normal activities like long distance walking, running, standing can be resumed within 1-2 days. 5 Facts Women Should Know About Ovarian Cancer !! !